OSU Baseball Helps TRES Knock Testing Out of the Park! Spring signifies many things in Ohio. Flowers, warmer weather, Opening Day for Baseball and in schools, testing season. Mrs. Slisher's third grade class at Taylor Road Elementary School have been prepping for their tests with a baseball theme. 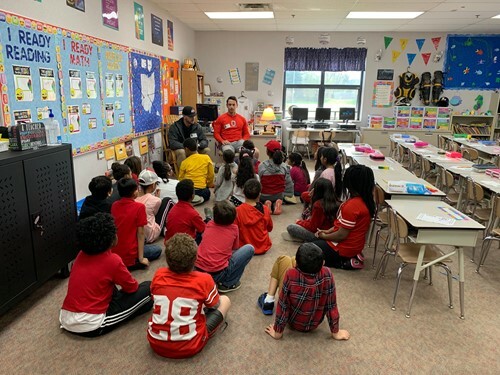 The students have written letters to baseball teams throughout Ohio and have received "fan mail" from the Cincinnati Reds, The Toledo Mudhens, The Columbus Clippers and of course, your Reynoldsburg Raiders. Today, students were working on identifying key components in reading sentences when they heard the announcement that they had some new fan mail. This time, the mail was in the form of Matt and Brady, two players on The Ohio State University Baseball Team! Matt, an infielder, and Brady, who plays outfield, answered questions from the class ranging from what age they started playing baseball (age 7 and 8) to if they ever get a day off for their birthdays (they do not.) Matt and Brady told the class about their schedules, how they balance school and playing baseball, and talked about how important school is to them. After the Q&A, the players took a group picture and signed the students' notebooks. They also brought posters of the team. Thank you Matt and Brady, and good luck Tornadoes, we know you'll knock those tests out of the park!